Donald Trump's top aide has denied receiving "payments" from the former Russian-backed Ukrainian government. "I have never received a single 'off-the-books cash payment,'" Paul Manafort said in a statement. 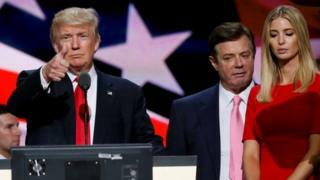 The New York Times reported finding ledgers pledging $12.7m (£9.8m) in undisclosed cash payments to Mr Manafort between 2007 and 2012. Hillary Clinton's campaign has called for Mr Trump's team to disclose any pro-Russia links. "The simplest answer is the truth: I am a campaign professional. It is well known that I do work in the United States and have done work on overseas campaigns as well. I have never received a single 'off-the-books cash payment' as falsely 'reported' by the New York Times," the statement reads. The New York Times article said Mr Trump's campaign manager and his business played a key role in advising Ukraine's former pro-Russian President Viktor Yanukovych, who fled after an uprising in November 2013. Mr Manafort's work advising Mr Yanukovych's pro-Russia political party, ended when the country's parliamentary elections were held in 2014, he said in his statement. The New York Times report said Ukraine's National Anti-Corruption Bureau had discovered the listed payments in the ledgers of Mr Yanukovych's then governing Party of the Regions - allegedly part of "an illegal off-the-books system". The bureau is also investigating business deals worth millions of dollars put together with the help of Mr Manafort's business. However, the bureau is yet to determine if Mr Manafort actually received any of the $12.7m. The Times quoted Mr Manafort's lawyer, Richard Hibey, as saying his client had not done so. "It is difficult to respect any kind of allegation of the sort being made here to smear someone when there is no proof and we deny there ever could be such proof." Mr Yanukovych fled to Russia after the uprising, miring Moscow and the pro-Western government in Kiev in bitter conflict since. Russia seized and annexed the Crimea region in 2014, and violence is continuing between Ukrainian troops and pro-Russian separatists in the east of the country, where some 9,500 people have been killed in more than two years of clashes. The Democratic Party insisted questions had to be answered given the "pro-[Russian President Vladimir] Putin policy stances adopted by Donald Trump". Mrs Clinton's campaign manager Robby Mook said: "Donald Trump has a responsibility to disclose campaign chair Paul Manafort's and all other campaign employees' and advisers' ties to Russian or pro-Kremlin entities, including whether any of Trump's employees or advisers are currently representing and or being paid by them." The Democrats have accused the Russians of trying to aid Mr Trump's campaign. Mr Mook referred to Russian hackers believed to be behind a security breach that targeted key Democratic party bodies this year. At the weekend, a hacker reportedly linked to Russia also posted personal contact information online of House Democratic Leader Nancy Pelosi and hundreds of other Democratic party officials. Ms Pelosi said she was flooded with "obscene and sick" messages. After the earlier leaks, Mr Trump drew fierce criticism for apparently inviting Russians to find emails that Mrs Clinton had sent via a private email server, contrary to US government rules, while secretary of state. The FBI recommended no charges be brought. Mrs Clinton says about half of the 60,000 emails have been turned over to the state department, while the others were private. "Russia, if you're listening, I hope you're able to find the 30,000 emails", Mr Trump had said. Mr Trump also drew fire by saying Russia would not enter Ukraine. When it was pointed out it had already annexed Crimea, he said he meant Moscow would not dare go further. Mr Trump has seen a downturn in opinion polls recently, following a string of controversial remarks. On Sunday, he tweeted: "If the disgusting and corrupt media covered me honestly and didn't put false meaning into the words I say, I would be beating Hillary by 20%."